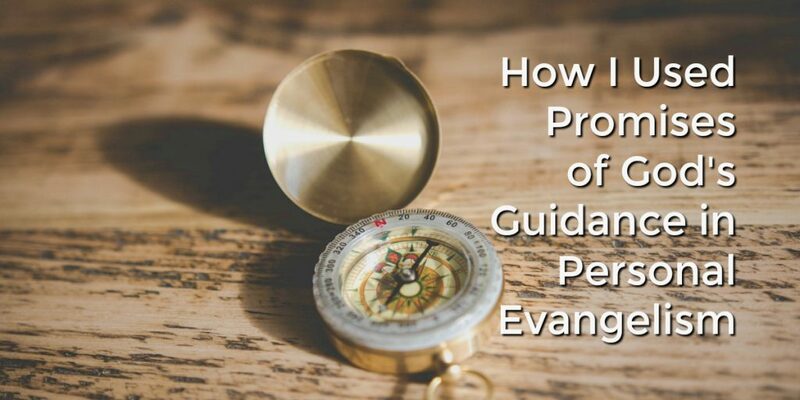 I teach on personal evangelism and various forms of church evangelism, so what does a list of promises on God’s guidance contribute to that discussion? If you are engaged in regular conversation with unchurched friends, you will encounter conversations about direction and purpose in life. You’ll encounter some non-believers asking “What is God’s will in this situation?” Such questions are an indication of their spiritual thirst. When your friends are making a major decision and talking with you about, you can point to these Bible promises and discuss how you have personally experienced them to be true. Your current life stories about these verses offer a real life example of your faith in the living God and how you follow Jesus in your daily life. As you share your life examples of God’s activity in your life, incorporate a verse or two about God’s guidance to show your decision making, how you trusted God, the steps of obedience that you took, and even the outcome of that obedience. 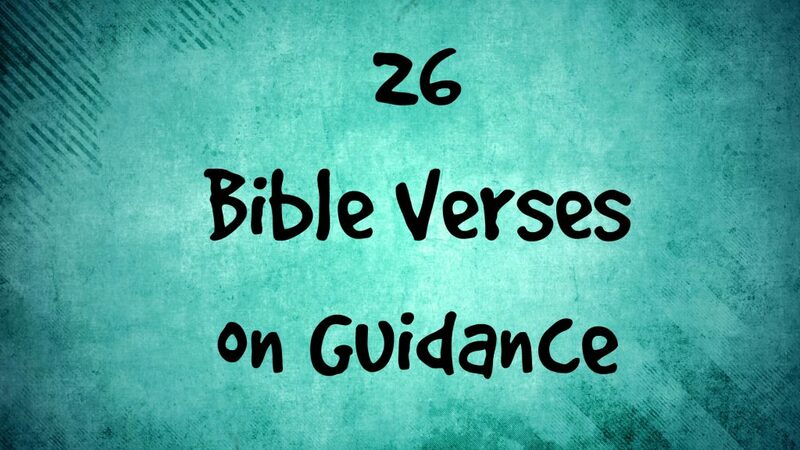 A personal example of using these Bible verses on God’s guidance. A friend and I were waiting outside a meeting that our kids were involved in. Instead of burying ourselves into our telephones to pass the time, we talked with each other. Thankfully, I was prepared to tell some of my faith story with him because I’ve reflected often on the various journeys, phases, and stages of my life. Some of the crucial decision crossroads. How I prayed about decisions. How I could trust God to lead me in the right direction. How some of these promises built my confidence in God’s guidance. My story from my life demonstrated my confidence in the promises of God and how I choose to live in the confidence of trusting God’s guidance rather than figuring it out all on my own. Psalm 25:4-5: Show me your ways, Lord, teach me your paths. Guide me in your truth and teach me, for you are God my Savior, and my hope is in you all day long. James 1:5-6: If any of you lacks wisdom, you should ask God, who gives generously to all without finding fault, and it will be given to you. But when you ask, you must believe and not doubt, because the one who doubts is like a wave of the sea, blown and tossed by the wind. Psalm 5:8: Lead me, Lord, in your righteousness because of my enemies— make your way straight before me. Psalm 31:3: Since you are my rock and my fortress, for the sake of your name lead and guide me. Psalm 61:1-2: Hear my cry, O God; listen to my prayer. From the ends of the earth I call to you, I call as my heart grows faint; lead me to the rock that is higher than I.
Psalm 143:8: Let the morning bring me word of your unfailing love, for I have put my trust in you. Show me the way I should go, for to you I entrust my life. Psalm 16:7-8: I will praise the Lord, who counsels me; even at night my heart instructs me. I keep my eyes always on the Lord. With him at my right hand, I will not be shaken. John 10:3-4: The gatekeeper opens the gate for him, and the sheep listen to his voice. He calls his own sheep by name and leads them out. When he has brought out all his own, he goes on ahead of them, and his sheep follow him because they know his voice. Psalm 32:8-9: I will instruct you and teach you in the way you should go; I will counsel you with my loving eye on you. Do not be like the horse or the mule, which have no understanding but must be controlled by bit and bridle or they will not come to you. Romans 12:1-2: Therefore, I urge you, brothers and sisters, in view of God’s mercy, to offer your bodies as a living sacrifice, holy and pleasing to God—this is your true and proper worship. Do not conform to the pattern of this world, but be transformed by the renewing of your mind. Then you will be able to test and approve what God’s will is—his good, pleasing and perfect will. Psalm 19:8: The precepts of the Lord are right, giving joy to the heart. The commands of the Lord are radiant, giving light to the eyes. Matthew 7:7-11: “Ask and it will be given to you; seek and you will find; knock and the door will be opened to you. For everyone who asks receives; the one who seeks finds; and to the one who knocks, the door will be opened. “Which of you, if your son asks for bread, will give him a stone? Or if he asks for a fish, will give him a snake? If you, then, though you are evil, know how to give good gifts to your children, how much more will your Father in heaven give good gifts to those who ask him! Proverbs 11:14: For lack of guidance a nation falls, but victory is won through many advisers. 1 Chronicles 10:13-14: Saul died because he was unfaithful to the Lord; he did not keep the word of the Lord and even consulted a medium for guidance, and did not inquire of the Lord. So the Lord put him to death and turned the kingdom over to David son of Jesse. Hebrews 11:8: By faith Abraham, when called to go to a place he would later receive as his inheritance, obeyed and went, even though he did not know where he was going. All verses are from the NIV Bible. Please… It is not Psalm(s), it is Psalm, singular. I couldn’t see anything beyond that repeated misuse of the plural when speaking of a singular. I’ll come back another time to visit, but today, it was kind of like visiting a church for the first time and being greeted by someone who can’t formulate a proper sentence or is a little too “rough around the edges” to be a first contact between a visitor and the church. Based on your comparison, I’m not sure you’d feel comfortable visiting my last church if imperfect English is a enjoyment distraction for you. We had people from 25 nations who could speak 45 languages. Grammatically perfect English was not one of them. In my current church, 97% of our fellowship doesn’t speak English as their first language, so we abound in grammar errors when English is spoken. I’m sure you’d never come back to either one. Thanks for pointing out. So sorry it was a hangup for you. The highlighted entries, ie, the scripture references, etc are hard to read against a white background. The way you did it below in the post comment box is better. I am just starting to read your pages. Thanks for sharing. I don’t know how to change colors on my theme. Jesus is looking for what is in our hearts, not how well we speak…just a thought. I found this to be an awesome selection of scriptures that have ministered to me!! Thank you!! I’m learning to seek God in all that I do and will meditate on these scriptures. God Bless you! I am at a time in my life where I need to look to God for guidance with urgency. These are just the scriptures I need to build up my faith to trust Him and expect to receive guidance from Him. I will meditate on them and speak them, and trust His Word. Thank you for putting these together, so helpful. What a great selection. I’m so blessed. The Lord is no respecter of persons..
Be not so much of this world, but of a godly mind and heart. Encourage each other- for God knows all that you think and all that you are.